I was given product in this post for the purpose of review. i was not paid to write this review. All opinions are my own. I was born in 1987, which means I grew up with some pretty awesome cartoons. First it was The Gummi Bears, My Little Pony, Fraggle Rock, Jetsons, The Flintstones and of course Loony Tunes. Then came the Rugrats, The Wild Thornberrys, Hey Arnold, Ed Edd and Eddie, AHH Real Monsters, Ren and Stimpy and so many more. It has been years since I watched these shows and I am super excited to see many of them are now being released as full series sets. It means I get to share them with my boys! 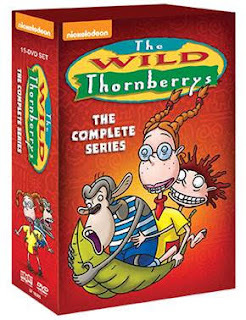 This fall, climb aboard the Thornberry CommVee and get ready for a wild adventure with the release of The Wild Thornberrys: The Complete Series on DVD. Available at Wal-Mart on October 20th, 2015, the 15 disc set contains all 91 globe-trotting episodes of the popular Nickelodeon series. I love sharing these childhood favorites with my boys. And they are still as fun at 28 as they were when I was a kid! !